In my area (central Illinois), Tricholoma sejunctum is the most common Tricholoma species, typically fruiting in early fall, just as the leaves are beginning to change. The distinguishing features of this widespread species include its cap, which is yellowish to yellowish olive with darker appressed fibers (especially over the center); its gills, which are white at first but later develop yellow shades, especially towards the cap margin; and its strongly mealy taste and smell. 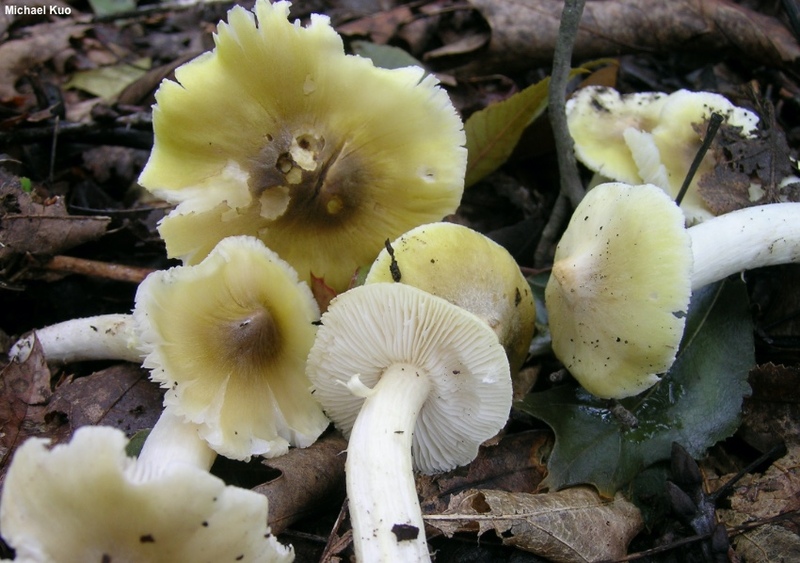 Similar Tricholoma species either lack the dark fibers on the cap, or have completely yellow (or completely white) gills from youth to maturity. Tricholoma subsejunctum (named by North American mycological pioneer Charles Peck) is considered a synonym by some mycologists. However, it may be the best name for North American versions of this mushroom, since the "true," European Tricholoma sejunctum is often described as more yellow and less fibrillose. Ecology: Mycorrhizal with hardwoods or conifers; growing scattered or gregariously; widely distributed; late summer and fall. Cap: 5-7.5 cm; broadly convex, flat, or with a central knob; sticky or dry; yellowish to yellowish olive; with dark, radiating, appressed fibers (especially over the center); the margin often somewhat inrolled when young. Gills: Attached to the stem by a notch; close; white, developing yellow tinges near the cap margin in age. Stem: 5-10 cm long; 1-2 cm thick; equal; smooth; dry; whitish or with yellow tinges. Flesh: White; not changing on exposure. Odor and Taste: Taste mealy (apparently bitter in some collections); odor mealy. Microscopic Features: Spores 5-7.5 x 4-6 µ; smooth; elliptical to oval; inamyloid. Cystidia absent. Clamp connections absent. REFERENCES: (Sowerby, 1798) Quélet, 1872. (Fries, 1821; Saccardo, 1887; Smith, Smith & Weber, 1979; Ovrebo, 1980; Arora, 1986; Lincoff, 1992; Shanks, 1994.) Herb. Kuo 09299603, 10020303.